Day two of the conference is mostly workshops. Here are the workshop facilitators. Our soils really are the basis of all life on earth, and yet they exist as the merest sliver of matter coating our planet. Soils are the unquantified factor in climate change mitigation, and nowhere more than in pastoral farming is this more cogent and relevant to our conference theme. Bev has been getting her hands dirty farming a 500 acre drystock farm in the lower Kaipara catchment for over 14 years, and in that time has managed to grow her topsoil from 1-2cm to more than 20cm depth. In 2017 she was recognised for her regenerative farming in the Ballance Farm Environment Awards, achieving the regional Beef + Lamb NZ Award for Livestock, the Auckland Council Award for Water Quality Enhancement, and also the Massey University Award for Innovation. Carol and her family have an avocado orchard. For some years she has been concerned that primary producers did not have easy avenues for diverting reject fruit to those who were ‘food insecure’. Carol was keen to see food provided to those in need and the waste of good quality but unmarketable primary produce prevented. From her practical experience and academic perspective – she has a PhD in community-led development – she connected with others to meet those goals of food provision and preventing food waste. Carol lived her early working life in Canada, Britain, Saudi Arabia, Singapore and Malaysia, working with refugee communities, establishing a Montessori School in Singapore and illustrating books. In 1986 she returned to New Zealand, and in Auckland worked with young people in Onepoto Awhina, helped establish a Tongan language nest, and with the North Shore City Council supported the establishment of 3 community arts centres. In 1992 Carol returned to her home town of Whangārei, built a house on the family farm and got involved in establishing One Double Five Community House. This project has developed a community law centre, whanau support and a number of community development projects. Since 2002 Carol has been involved in establishing a waka,ama group, a school, Taitokerau Emergency Housing Charitable Trust, Channel North TV, and in supporting marae developments,. In 2017, with a boost from research done by Northland District Health Board, Carol began working with others on Food Rescue Northland / Whakaora Kai Taitokerau. In the first year of operation alone, Food Rescue Northland has provided 15,400 meals and diverted 17.5 tonnes of food from waste. 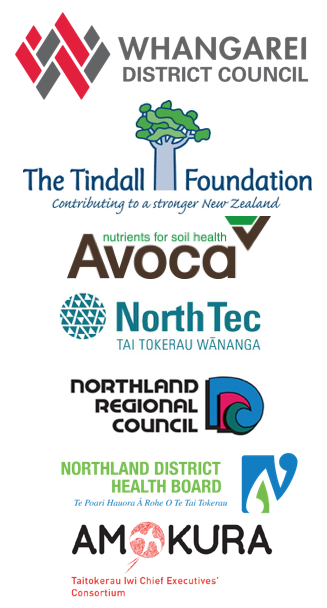 This project has just begun to address the major goal of reducing food waste in Northland. Much more is needed to reduce domestic and food producer waste in our region. Joe started his adventures at age 17, leaving his 13 siblings and family farm in Pennsylvania in the wake of his 13 foot white-water kayak en-route to Key West Florida. This 1,400 mile adventure, was the start of a life long journey to explore the ends of the earth. Joe spent the next 8 years sailing the world, spending extensive time in the Mediterranean, Pacific, Caribbean and New England, gaining a 200 ton US Coast Guard License. He met a girl and started University, earned a Bachelor Degree in Civil Engineering and Masters in Environmental Engineering. After University, the sea called again and he moved his young family a-board a classic 1956 Wooden Bahamian Ketch and spent the next eight years sailing, home schooling and working in the Caribbean. During this time the family embraced renewable energy, converting the 1956 Sailing Ketch to solar and wind power and the family lived aboard carbon neutral. The Camusos currently reside in Whangarei. During the last 11 years in New Zealand Joe has worked with the Northland Regional Council as the Rivers and Natural Hazards Manager helping the region adapt to climate change and sea level rise and has been a leading advocate for electric vehicles, renewable energy, energy conservation and reduced single plastic use. His time spent on the oceans and passion to leave this planet better off for our children drives him to find innovative solutions to provide a better planet for future generations. Having been bought up on a Northland dairy and beef property near Maungatapere, Kathryne pursued her passion for agriculture by completing a Bachelor of Agriculture at Massey in 1990. Majoring in production and management, she extended herself by working on farms in both hemisphere including Australia, England, Zambia and the United States. She encountered many varied production systems including pigs, beef, dairy, cropping and even turkeys. After a number of years share milking Kathryne became a technical field rep’ for Ballance Agri-Nutrients, quickly moving up the ranks to become a key account manager for Northland. The 12 years she spent here meant she became highly proficient at helping farmers get the most out of their nutrient inputs under Northland’s challenging climatic conditions and varied soil types. Kathryne furthered her understanding of nutrient management and sustainability in Northland when she became land management advisor for the Northland Regional Council. Looking after our waterways and the life within goes hand in hand when protecting our natural resources. Kathryne then became a Sustainable Dairy Advisor for Fonterra, working with farmers to reduce their environmental footprint and optimise their nutrient inputs, and fence off waterways and sensitive areas. Now working full time with WSP-Opus as a Rural Infrastructure Consultant which involves work with both Fonterra Living Waters and Beef+Lamb NZ working with landowners to highlight challenges and solutions to improve their environmental impact across the greater Northland region. Within my role I also work as Field Program Lead for the Integrated Kaipara Harbour Management Group, an iwi led non-for-profit group whose key purpose is to promote integrated management and inter-agency coordination and kaitiakitanga of the Kaipara Harbour and its catchment. This process utilises both traditional Maori philosophy and western science to manage the Kaipara as an interdependent system, working towards a common vision “a healthy and productive Kaipara Harbour”. Today she continues to run a 300-acre Beef block at Maungatapere which involves the challenges of farming in an ever-changing environment with nature at the core particularly on a flood plain. Pat was born in Japan, grew up in Florida and could not wait to head out and see the world. As a child he would put his finger on a map and wonder what a place was like; this curious streak led him to visit about 75 countries and learn to speak the better part of six languages. With each return to the USA, Pat became more aware that he did not belong there and he grew tired of paying taxes to support foreign wars. Eventually, he left and never returned. About 16 years ago Pat arrived in New Zealand and worked all over NZ for several years in the telecommunications sector. In 2009 Pat decided to change professions and decided to try to make a positive impact in doing so. This led him to gain a BAppSci in Energy Management and Environmental Management at Otago University, and later to complete a BEngTech in Electrical engineering. Pat currently works with Energy and Technical Services in Wellington, and travels around Aotearoa regularly to assist clients with energy, carbon and sustainability related issues. In the recent past he was also a Green Party candidate in both national and local body elections. He is passionate about environment and sustainability issues, and feels that how we use energy is a major part of the equation.